I'm thrilled that a manuscript I edited for the wonderful Professor Ron McCallum AO and his wife Professor Mary Crock is being published by Allen & Unwin. It is Ron's life story and is due for release in 2019. 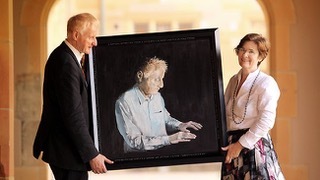 Ron and Mary holding the portrait Mary painted of him (copyright James Croucher). My book ‘Nice Girl – The story of Keli Lane and her missing baby Tegan’ was published by Simon & Schuster in 2011. Please feel free to browse my ‘where is Tegan?’ twitter account for a day by day record the 2011 sentencing hearing and the main points of the Court of Criminal Appeal’s 2013 judgment upholding her conviction. I worked as a full time journalist for the Australian Financial Review and magazine titles within Fairfax Business Media before becoming an author and freelance feature writer. Besides being able to write about general human interest topics, my training and practice as a lawyer means I can report on court hearings of any kind and write about technical legal issues in an easily understandable and engaging way.